This anthology of adult learner stories is testimony to the resilience of human lives, the critical role of lifelong learning, and how adult literacies weave through our journeys, visibly and invisibly. A project of RaPAL, ACAL and Festival of Learning. The impetus for ‘Resilience – Stories of Adult Learning’; came from a need to gather and publish the authentic voices of learners across many different adult learning environments. There was also a need for collaboration between adult literacy practitioners in Australia and the UK, to build networks that could work toward greater understanding for communities and policy-makers. We’ve collected over a hundred stories from across our two nations, edited and published the collection into multiple formats, including paperback, e-book and pdf. Why get it, and what you might do with it? If you’re working in adult education, you’ll be very familiar with the themes of this publication. Some of the themes are challenging and disturbing, and will resonate strongly for adult learners you’re working with. These stories could be used in class as models of personal narrative; they could also be used as potential inspiration for adult learners creating their own recount of overcoming adversity, or looking for reasons to persevere with their own learning. How did the publication come to be? People at RAPAL in the UK had been already working on this project when members of the ACAL committee were invited to join. Over eighteen months of organising, publicising the project and collecting stories came before the final editing and publishing stages. Tara Furlong in the UK managed to pull all the stories together in a way that would allow publishing multiple formats. In a process involving many international phone calls and skype chats the Australian team, including Keiko Yasukawa and Ros Bauer from ACAL, worked hard to support this editing process along the way. It’s available as a PDF, ebook or Kindle version. 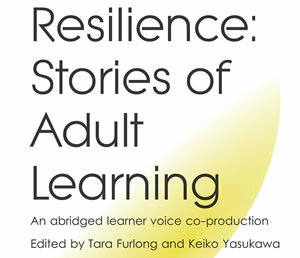 You can download and use ‘Resilience: stories of adult learning’ in any way you choose. We simply ask you acknowledge if you take extracts.